It’s such a shame that I’m just now writing about these memoirs, considering that both have been sitting in many ‘NEED TO READ’ notes and documents on my iPhone and computer for a combined total of two years. What’s even more absurd is that after I ordered both books, I left them on my bookshelf for weeks. Perhaps I was waiting for the perfect moment in which I could fully absorb (and completely devour) them, and a snowy day a few weekends ago was it! I had already started Bird of Paradise a few days before, but I finished the bulk of it and the entirety of How to Die in Paris in one day. There was something so enchanting about spending the day fully engaged with the meat of two peoples’ life stories. I laughed and cried and shouted and gasped and went mute at so many moments while reading these memoirs and I felt invigorated after the experience. 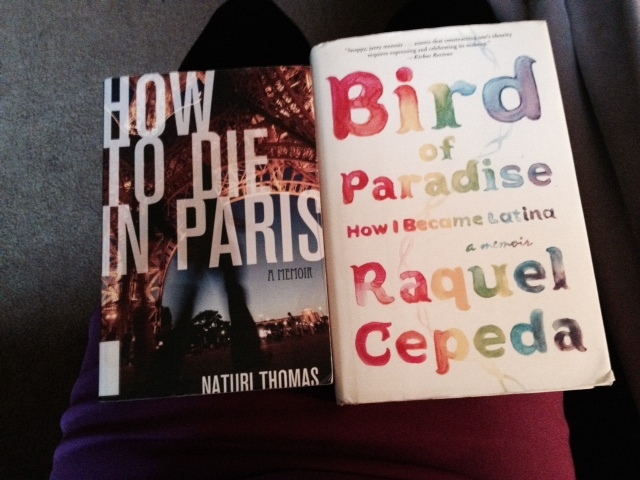 Through the process of reading about Raquel Cepeda and Naturi Thomas’ lives in their own words, I almost felt challenged to assess my own life with different eyes. The messages in these books will resonate deeply with any reader and I highly recommend that you pick them up and dive into their worlds as soon as possible.